I love target date index funds. I believe they’re your best bet to maximize long term wealth and almost every individual investor should put 100% of his or her equity portfolio in a single target date index fund. Seriously. What are target date index funds? They’re named after a target retirement year: A couple examples are Vanguard’s Target Retirement 2050 Fund and Fidelity’s Freedom® Index 2055 Fund. They’re index funds: That means there’s no smart guy getting paid a lot of your money to pick and choose stocks for you. Instead, they hold the entire “index” of available stocks. Index funds have much lower fees and studies show over and over they’re very likely to beat actively managed funds over time. Owning all the stocks guarantees you your fair share of market growth. They shift over time: As time goes on they move from a heavy stock allocation to maximize growth while you’re young, to a heavy bond allocation to provide income and capital preservation in retirement. Diversification: They contain thousands of US and international stocks. (9,882 different in the case of Vanguard’s 2050 fund for example). So you have the power of nearly every publicly traded company on the planet working for you. Every Sector: Tech, retail, health care, transportation, energy, etc are all represented. Instead of guessing which sector to invest in, a target date index fund removes individual sector risk by owning them all! 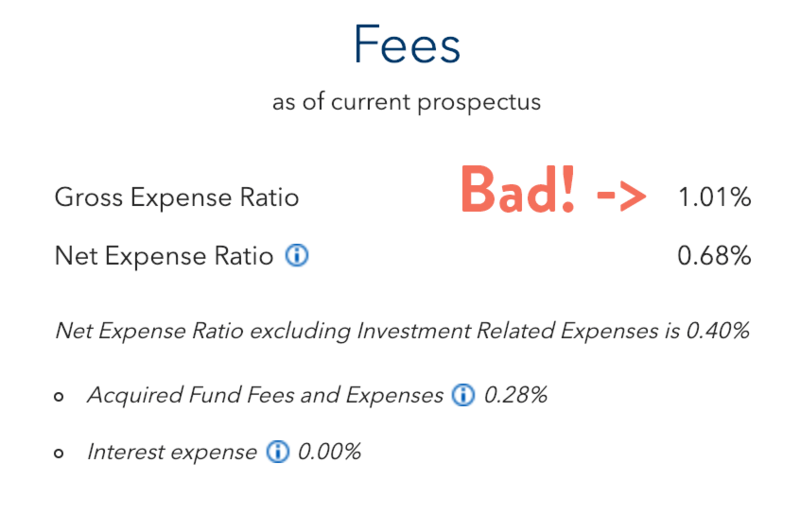 Low cost: Mutual funds often have expense ratios of 1% and higher. Target date index funds have expense ratios generally around 0.15%. That may not sound like a big difference but over the course of your life it could save a quarter or more of your whole portfolio that would otherwise erode to fees. Auto-Rebalancing: These funds automatically rebalance themselves so you don’t have to worry about it. International stocks are way up while the US is down? It will rebalance to stay on the target asset allocation. Regularly rebalancing mathematically improves returns over time. Auto-Reallocating: As you get older, they automatically shift to more conservative investments to protect your nest egg and provide income in retirement. Eliminates guesswork: Even a simple three fund portfolio can have a lot of options. How much do you put in each fund. And when they perform differently, it can be tempting to change your mind and allocation. That jumping around is likely to hurt your long term performance. With a single fund, you dump everything in it, forget about it and you’re rich. Simplicity: With one fund, it makes your life simpler when deciding what to buy. This simple “set it and forget” mentality can help with bad human behavioral tendencies like chasing past performance and trying to time the market. Throwing in more funds won’t make you more diversified or improve performance, it will just make you more likely to lose to the market over time. A single target date index fund guarantees you your fair share of the market and automatically manages risk over the course of your life. Not all “target retirement date funds” are INDEX funds. 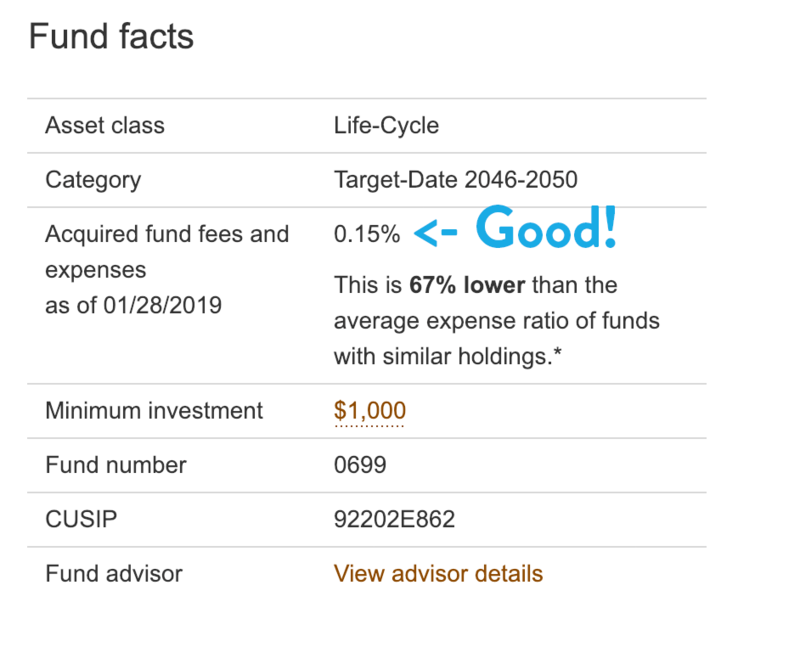 If you buy an “actively managed” target retirement date fund, you’ll be paying much higher fees and will be very likely to lose to the market. So how do I buy one? If you’re investing inside a 401k or 403b, your company may offer a target date index fund option. If not, your best bet is to buy and hold 2-3 individual index funds according to the rules on the home page, then roll over your 401k when you leave that company. If you have your own IRA or brokerage account, then you need to look up the target date index funds offered with no load and no transaction fee by your brokerage. My favorite brokerages are Vanguard and Fidelity. To choose a target date index fund, choose your projected retirement year from the chart below, then you’ll find the ticker symbol for that fund from your brokerage. Note that choosing an earlier year doesn’t mean you’ll get to retire earlier. It just means your investment will get more conservative earlier. If you want to be more aggressive with your investment you would actually do the opposite and pick a later year, but the asset allocations they have chosen at the given dates are reasonable and being realistic with retirement date is wise.